I didn't start sewing until I was over 30. My girls start sewing when they can sit in my lap at the machine and keep their hands in their own laps. 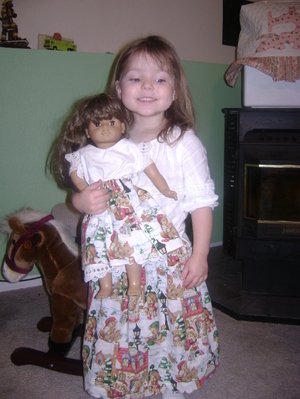 Bailey started on the machine by herself at age six and she really enjoys sewing. She turned nine in February. She made the pillow on the left for Aaron's mother for her birthday (sshhh, it is in the mail now) and the pillow on the right for me for Christmas. 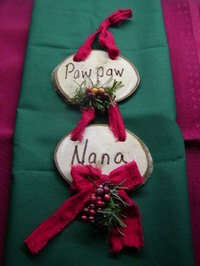 She has made others for family members as well. She has an entrepreneurial mindset and is always trying to think of something she can do or make that can be sold. Some friends of our have a tiny consignment shop just for children to place their handmade goods to sell. She made a few bookmarks and has turned over a tiny profit from those. She has not been convinced that folks would buy her pillows but I think she is wrong. She has decided to give it a whirl. This is her first pillow that she is hopeful to sell. It measures about 15 inches X 15 inches. She plans to make more and we will post them here as she plans and completes them. Do you homeschool? Are you thinking about it? 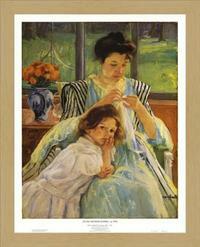 I have just finished read a book called Relaxed Homeschooling. It is written by Mrs. Kelly Crawford of Generation Cedar. I have been reading her blog for quite some time now. Her writings will challenge you; they will provoke you ... I assure you that the Lord will use her words to change things in your heart. She has just published this e-book and it is well worth your time and pennies. Relaxed Homeschooling is to-the-point. This book is well-organized and easy to read. She gives tips and ideas throughout the book for fun ways to learn and good things for the littlest ones in the house to do while you work with the older children. I have to admit that homeschooling in her home and homeschooling in our home look very similar. The methods and ideas that she presents really work! The things that she is articulating are working so well in our own home...I so encourage you to read her book. My girls and I have such a wonderful time learning every day. If you would like to purchase Mrs. Crawford's book, scroll back up and look to your right and click on the picture of the book. It will take you to a link to make your purchase. Also, you can click here to make your purchase. Homeschooling is about to get exciting! Homeschooling is hard work. But it isn't supposed to be drudgery! After hearing so many moms who were discouraged about "keeping up", always feeling behind, overwhelmed and inadequate, I decided to put on paper some incredible things we've learned on our homeschool journey. Whether you are one of those tired moms, contemplating giving up, or just need some relief, or whether you are considering homeschooling and don't know where to start, you'll find this ebook full of answers and practical help. Teaching children is easier than you think! How to follow a routine without a restricting schedule. Giving your children a full education without enslavement to a curriculum. The classroom all around you. You can read more about her book when you click here or by clicking on the picture of the book above. The Klause girls all arrived into this world with very fair skin. Between their fair skin and a desire that the entire world not be privy to their tiny f*nnies hanging out of their swimsuit bottoms, it seems the only available option was for me to make their suits. I found only one company that had suits with sleeves and skirts/shorts but 1) I just didn't like any of them; and 2) boy, they cost a lot of pennies. I purchased a pattern from Ms. Smisor at Fashionably Modest Patterns, purchased the necessary fabric and notions and set about to making swimsuit #1. First of all, let me encourage anyone that would like to make their own swimsuits. However, let me also tell you that you will need to set your mind firmly to the task because it will take some time, lots of patience, lots of trial and error and lots of determination. The pattern itself (and other swimwear patterns I have looked at) are not difficult at all. The challenge lies in sewing with lyrca. Determining the amount of tension that is necessary to move the fabric through the sewing machine and serger along with the amount of tension necessary to place on the thread will take nothing more than trying it until you find what is needed for your machine(s). 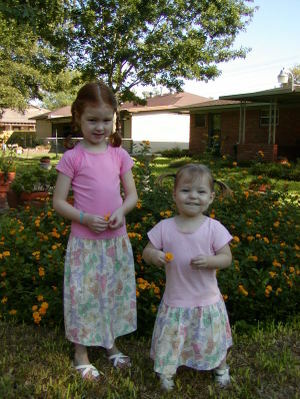 After I make Addison's suit and Bailey's suit then I will go back and shorten Kennedy's skirt some. It turned out longer than I had anticipated. Each of the girls will have this butterfly on their suit. Kennedy wanted a pink swimsuit. Bailey wanted a turquoise blue. I wanted to make Addison a yellow one but opted to veer from the light color that would surely be promptly soiled with the dirt she will plop down into the first 42 seconds she is wearing it. ;0) Addison's will also be turquoise blue. 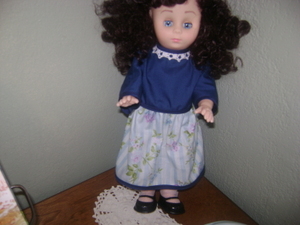 I trimmed Kennedy's skirt with turquoise thread and will trim the other girls' skirts with hot pink. I believe Ms. Smisor placed this particular pattern about an intermediate sewing level. Again, the seamstress should simply go into the project knowing that the construction is not difficult but the fabric is not so easy to work with. It will not be a project that you will zing together. This beautiful doily was handmade just for me by Mrs. Hunter. I just love doilies! They give such warmth to any room. Send an email to her at: nnannysh@yahoo.com or just give her a call at 817-480-1922. 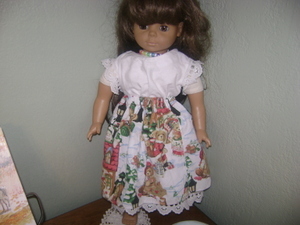 Dresses for 13" and 18" dolls. 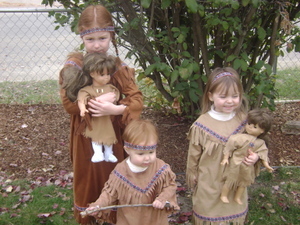 I will make matching little girl and doll sets as well. I will get some other photos posted. You can single left click on any of the photos to enlarge them. Whether she is almost grown or just little bitty. Sometimes we need something practical as we clean the floor or help Daddy rake the leaves. Other times something lovely and feminine is nice. Every day at about 5:00 p.m., we all stop to "gussy up" for Daddy. I want to look my best, freshen up, change clothes or remove my apron... I often keep my hair pulled back in a bun or twist until it is time for my beloved to arrive home, then I take time to make sure that my hair settles in a manner that is pleasing to my husband. The girls wash their faces and brush their hair. 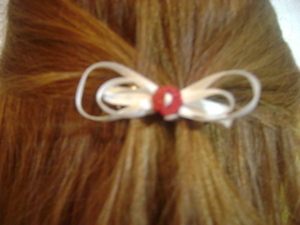 Finding a nice ribbon or clip to match their dress is always part of "gussy-ing up" for Daddy. However, if you do not have time or do not want to make your own, I would be happy to make some for you. The charge: $1 plus shipping. * One pair of clips will be $1. 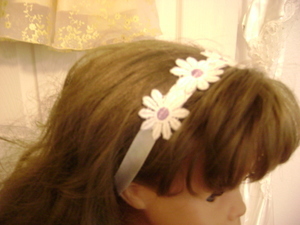 * One hair ribbon, long enough to be tied as a headband, will also cost $1. * I will charge only the actual shipping, which should always be less than $2 and most of the time less than $1. Each style has a name so as to avoid confusion when ordering. 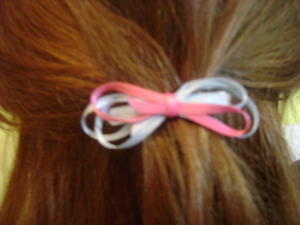 Just ribbon...all one color or two different colors. 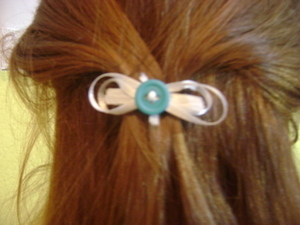 Ribbon, one or two colors with a plain, solid button in the center. 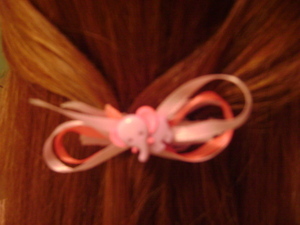 Ribbon, one or two colors with a fancy button in the center. Three buttons, you mix and match the colors. 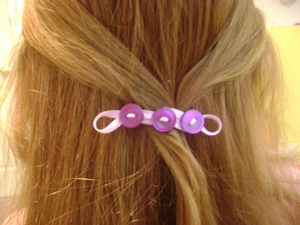 Looped ribbon with three buttons, you mix and match the colors. 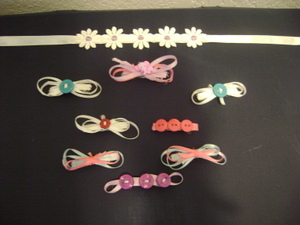 Ribbon, one color or two with a novelty button (leaves, flowers, stars, animals, etc.). 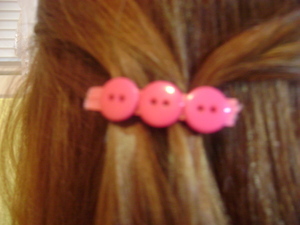 This clip is the cutest of them all with pale purple and hot pink ribbon that matches the little elephant just perfectly. I tried and tried to get a good photo, obviously without success. Currently, this is only available in a white flower with a pink center. You can select the ribbon color. Miss Hall can make something just for you or a loved one. This is a scarf she made for me to give to my brother. Now this picture just happens to show the backside as well as the front. It is navy blue and white. She made it exactly to the specifications that my brother requested. This is a shawl she made. 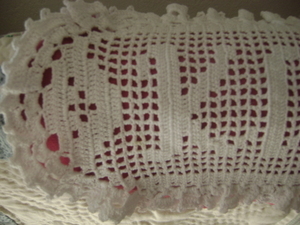 It is called a "summer shawl". I am blessed! My beloved husband bought me a wonderful sewing machine about four years ago. Before then, I had sewn nothing and never even touched a sewing machine. 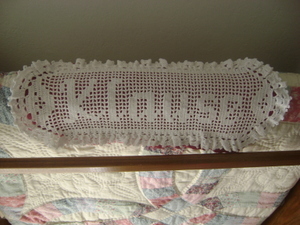 With the blessing of Mr. Klause, I am now making my handmade items for others and taking in alterations and sewing. I have come to enjoy the sound of the machine as it is always accompanied by the giggles of my little girls. I can work in my home, with my children at my side, to bring a little extra money. I am blessed! 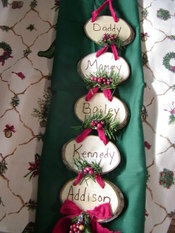 This little wall-hanging was hand-made by Mrs. Brodock. You can find her at Teaching Good Things. I ordered one for our family and several more for other families. They just all happened to have the Christmas theme to be hung for a Christmas decoration. However, I have just challenged her to make a very different one for me. Mrs. Brodock was wonderful in making exactly what I had in mind. It was a pleasure doing business with her and OHHHH... I didn't tell you... She only charges $0.50 per wooden card. Wow...simple, lovely and inexpensive. Thanks again Mrs. Brodock. 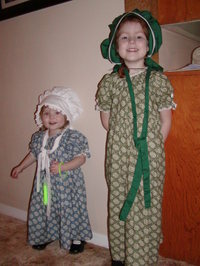 ~The dresses can look "prairie-ish" if you select the old-style calico fabrics. 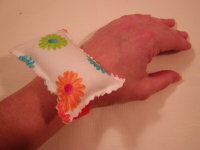 Or can be more "modern" with your fabric selection." 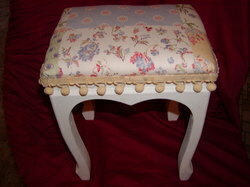 ~Add a decorative touch to a room. 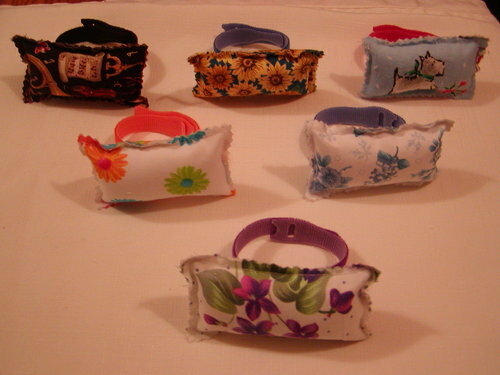 They are great for tiny tushes to sit upon while Mommy brushes Her hair. Good for doorstops too! 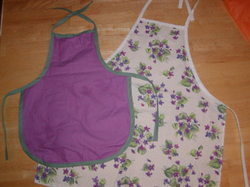 Tell me your kitchen “theme” and I’ll find a fabric to match (roosters, sunflowers, etc.). 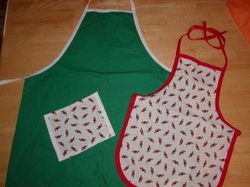 Matching aprons make wonderful gifts especially for grandmothers. Small fits age one to about five. Medium fits about age six to eleven. Large fits youth and adults. Contact me at mrs.klause@hotmail.com to place an order. Drop-waisted dresses are simple and fun; they make wonderful play dresses. The skirt fabric can be anything you might like. We like seasonal dresses at our house: pumpkins for October; leaves for November; candy canes for December, etc. I can make them with Her favorite color or theme (bears, hearts, etc.). These dresses also make nice cover-ups over swimsuits and ballet leotards with skirt fabric to match the purpose such as sunglasses & beachballs or ballet slippers. Size 12 and up, please contact me for pricing. The price depends upon the fabric selection & the amount needed. You pick the color, theme or fabric! ~My goal is to make your pads fit you! 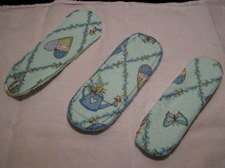 I will obtain a couple of measurements from you and make a trial pad to send to you. You try it and I’ll adjust accordingly. Then you order several if you like them.